In an inspiring moment at the conclusion of the Sending Out meeting this afternoon – the final gathering at Still Others – hundreds responded to the call to prayer from General Brian Peddle and Territorial Commander Commissioner Floyd Tidd, leaving their seats to come forward and stand around the huge floor map of Australia to pray for The Salvation Army, the state of the nation, their corps, ministries and the lost they were yet to reach. Dozens more also came forward, responding to an additional call by Commissioner Tidd for those interested in Salvation Army officership to make their way to the platform and join the newly-commissioned officers and those being made auxiliary lieutenants. Commissioner Tidd shared that, since the announcement two years ago that the two Australia territories would become one, The Salvation Army has commissioned 52 new officers, with an additional more than 30 others being made auxiliary lieutenants. And the people responded to his call. The Sending Out meeting is always a time of both sacredness and celebration as the newly-commissioned are welcomed, affirmed and officially “sent out” to their appointments and mission (pictured below). Led by the General and Commissioner Rosalie Peddle and Commissioners Floyd and Tracey Tidd, the meeting featured many moments of celebration, worship, reflection, and challenge. These included different people reading the National Vision Statement in their native languages; the presentation of Australian officers serving overseas, with Commissioner Peddle thanking them for their ministry and praying for them and their families; an inter-generational choir; and a stirring drama presentation from Lieutenant Nicola Poore. The newly-commissioned officers were also given their appointments – officially announced in September – and welcomed by their divisional leader(s). The General spoke to the congregation, thanking Commissioners Tidd and Colonels Mark and Julie Campbell for their “courageous leadership” over the past few years. “We leave inspired and confident that God has The Salvation Army in Australia in his hands,” he said. Reading from 2 Chronicles 7 and 17, the General also encouraged each person to consider where they fit in the present and future of The Salvation Army. “Australia needs to be forgiven and healed and The Salvation Army needs everyone to play a part in offering Jesus for that service,” he said. “Your territorial vision is capturing my heart and I hope it’s capturing yours. “When it comes to the gospel it’s serious; we can’t just fix things along the way – sometimes we need to jolt things if it’s for the glory of God,” he said, challenging the congregation. “We are his church and he will equip us, empower us and enable us to be more than conquerors. “We need a renewed burden for the souls of men, women and young people, to be acutely aware of lostness and brokenness and know how to apply the healing balm of the Holy Spirit. “We are The Salvation Army and we need to talk about salvation. Be proud to be God’s people. “We are an Army on a march, not in reserve, and we are already conquerors. We need to be ready to pay whatever it costs to deliver people from whatever oppresses them. 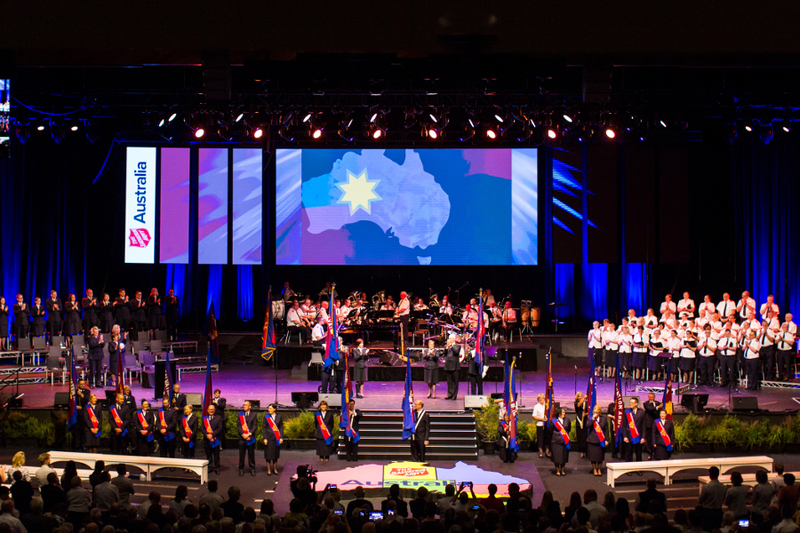 The Salvation Army in Australia is now one territory. A new era begins.